Soil as Beginning of Plan – What Can I do with My Soil? The soil under your feet is the basis for all future plans. Especially when planning for your property. Let’s say you want to run 4 horses on 38 acres, grazing as much as possible for feed. Looking at what your soil can produce is the place to start. Each soil has a productive capacity. To determine the characteristics of your soils, look at the Web Soil Survey, an internet tool developed by the soil scientists at the Natural Resources Conservation Service (NRCS). This website has replaced printed soil surveys. The Web Soil Survey allows you to find your land by address, latitude and longitude, section, township and range or just zooming on the aerial photo. Once you have found the land in question, create an “Area of Interest” by drawing the boundaries on the map and, Voila!, you will have all the information about your soils on your screen. By working through the tabs, there is a wealth of information about the soil chemical makeup, engineering strengths and faults, erosion likelihood and more. Forage and crop production figures can provide the limiting factors of your place. Now that you know your soils and what they can produce, it is time to look at how much you are producing. The best way is to clip and weigh the forage as well as identifying the different species of grass and broadleaf plants present. Knowing the species tells you what is good for your livestock. If you are growing mostly weeds and undesirable grasses, it will be green but not palatable. Seeing green doesn’t mean the plants are good for grazing. Comparing what is currently growing to what is expected will show where improvements can be made. A conservation plan is a good way to start laying out the changes needed. A grazing system, even on small acreages, can increase the amount of forage available. It is very unlikely you will be able to feed your livestock just by grazing. 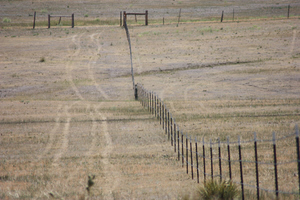 Even 1 horse will go through 40 acres of the best rangeland in a summer let alone spring and fall. Using grazing periods of a couple hours a day can get the most out of the pasture and preserve it for years. The NRCS, located in the USDA Service Center in Simla can help you develop a quality conservation plan to protect the resources you are counting on. Beginning with the soils and determining what you have is a good place to begin the conservation plan for your place. Whether you have 10 or 10,000 acres, knowing where you are and then where you are going makes lots of sense. NRCS & Double El Conservation District personnel, are located in Simla at 504 Washington St or give us a call at 719-541-2358. We are available to help with your conservation needs.